A comparison between present and future (RCP8.5) surface temperature anomalies. A 3-day smoothing has been applied to the output to dampen day to day variability. This simulation was made possible with help from numerous individuals within NCAR and from many outside collaborators who contribute to the CESM development and production runs. 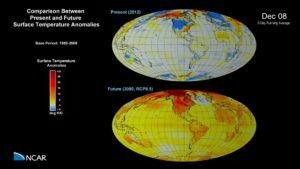 The Community Earth System Model (CESM) is a fully-coupled, global climate model that provides state-of-the-art computer simulations of Earth’s past, present, and future climate states.